I was surprised by the appearance of this subject. Any guesses? 20X onto a 23 mm sensor, slight crop. 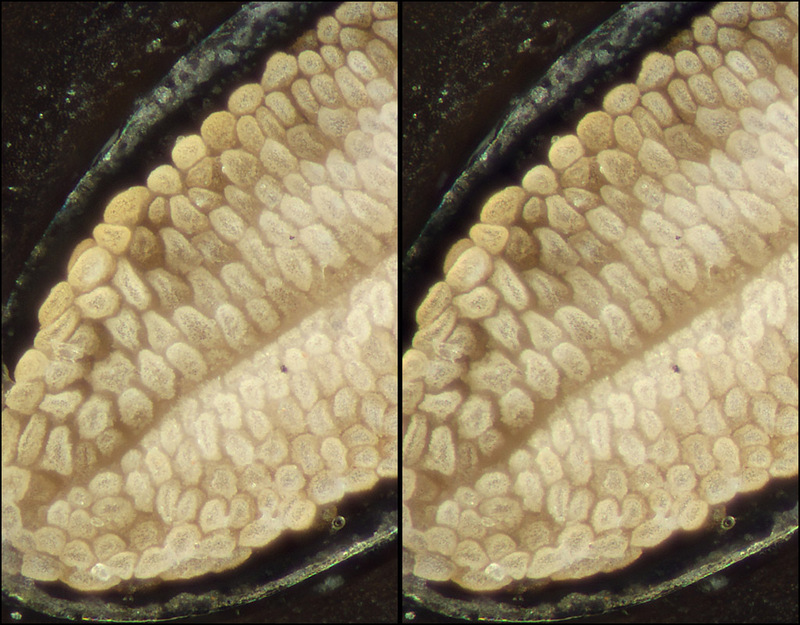 Focus stacked at 5 µm step, using Stackshot and Zerene Stacker, using a tripod-based setup similar to HERE. Edited: add ID and shooting info. I have no idea Rik. It looks a lot like pollen in a stamen but as that's what you'd expect that to look like I guess it's something different. Is it a large spiracle? Hmm, well, at least it's spring and Rik could be following an old habit and ripping the flowers apart again. I don't know but the concavity in which it resides might be significant. Here is an even closer view, shot this time with Nikon CF Plan 50X 0.55 inf/- EPI ELWD on an ancient Vivitar 200mm f/3.5 tube lens. This may have been sharpened beyond the point of realism, but the enhanced surface texture helps to lock up the 3D impression. 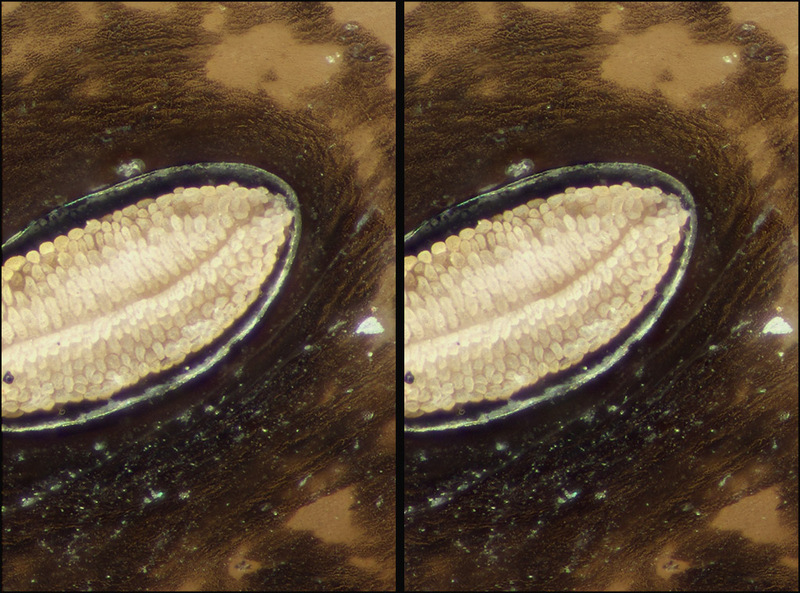 Focus-stacked at 2 µm step size using StackShot and Zerene Stacker in a horizontal platform setup similar to HERE. Oh dear me -- I've gotten distracted and forgotten my manners! Is it a large spiracle? Just so -- at least for some definition of "large". 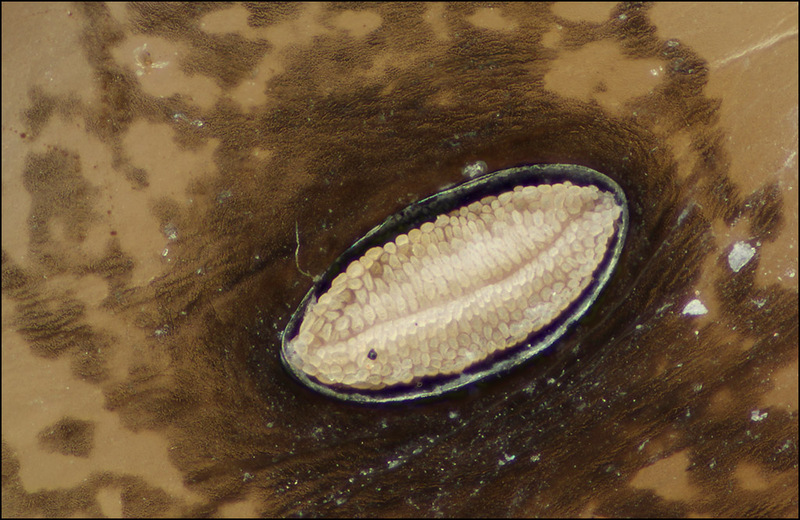 The spiracle itself measures 0.44 mm in length. The subject is a cutworm caterpillar, overall length 25 mm. I caught it eating the swelling buds on my grapevine several weeks ago, after noticing that the vine was gradually becoming denuded. 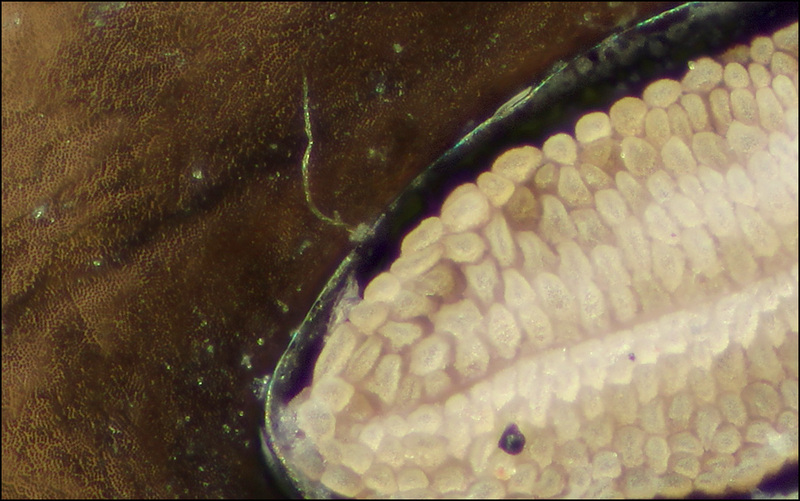 I slipped the caterpillar under the microscope, was surprised by the appearance of the spiracles, and stashed it live in the refrigerator until I had some free time to photograph it. I intended to photograph it live, keeping it quiet by chilling, but that didn't work out very well and I ended up accidentally killing the beast by freezing it. The state as photographed in the initial posting here was freshly killed, rinsed in water and then in 99% isopropyl alcohol and briefly air-dried to remove surface moisture. For the 50X version, it has had some chance to dry out a little more. I really do not know what the white lumps are. I presume that they are surface texture on the two main lips of the spiracle, but it's a mystery to me why they are so different from the surrounding cuticle. Time to study the literature, perhaps. These images have prompted me to read the discussion of spiracles and other respiratory apparatus in "The Insects / Structure and function" by R.F.Chapman. Fascinating stuff!